Please meet Beautiful Bugsy! 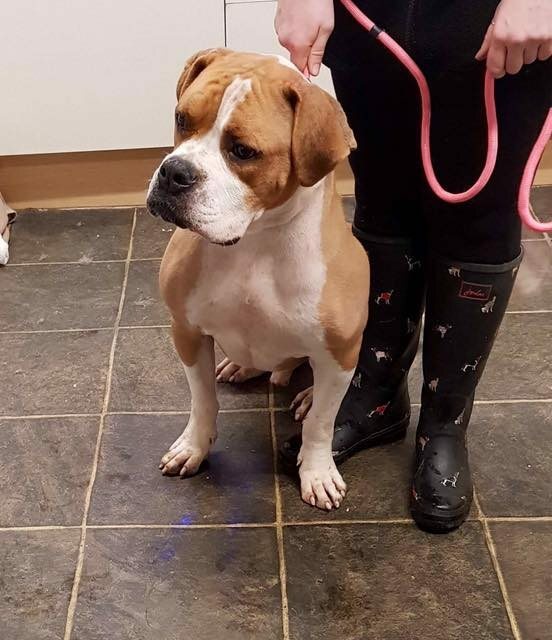 Bugsy is a 1 year old male American Bulldog cross Boxer. Bugsy came to us from the pound after his owner was arrested and nobody could look after him. He was in a pretty sorry state with bad skin and ears, likely due to kennel stress. 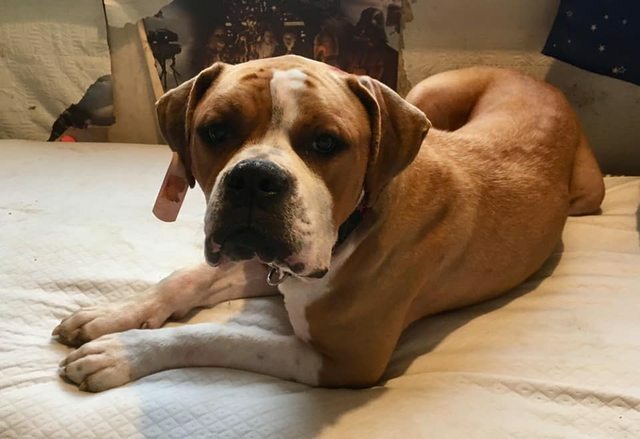 He is a young American Bulldog possible Boxer mix of approximately a year old, whatever he is he is stunning both inside and out and just a huge dollop of love! Bugsy is always on your lap wanting cuddles and attention and is always wanting to please! So adorable that he managed to weedle his way onto my bed on his first night with me, and has pretty much stayed there ever since! He is initially strong and excitable on the lead but soon settles down and walks well. Bugsy is clean in the house, and perfectly crate trained! He is non destructive and loves playing with a ball, well any toys really, he is a big daft pup! He can be left perfectly for short periods. He travels well in the car and is quite content to watch out the window. 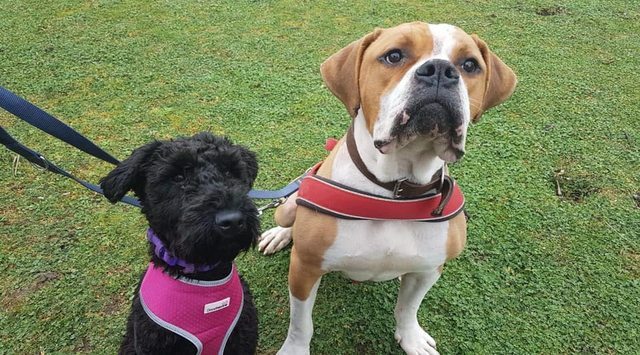 Bugsy is fantastic with dogs of all shapes and sizes, and is just a big lovable lump! Anyone who adopts him is going to be very lucky to have him as part of their family! He is absolutely adorable, with a kind, loving heart. Can you offer this softy a place in your heart and on your sofa? 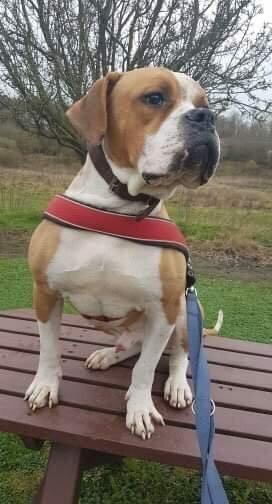 He would make a perfect family pet and can live with children no problem, as long as they are used to large boisterous breeds! Ideally he needs someone that has breed experience and is aware of common ailments such as allergies. For further details regarding adopting a dog from All Animals Rescue and Rehome in Essex please email animalrescueandrehome@hotmail.co.uk. Please note, emails/applications etc are responded to as soon as possible, but this may be up to 4 days. All animals rescue and re-homing is a non kill rescue that will take any animal in need of rescue. All animals that come in will be fully vet checked, flead and wormed, neutered, microchipped and vaccinated, also every animal will be fully assesed in a home environment for at least 3 weeks. All potential adopters will be asked to complete a questionnaire and an adoption fee from £175 applies.